"A surreal political circus is wheeling its way through the frosty streets of Tampere, Finland's third-largest city. In one ring is the Soldiers of Odin, a far-right vigilante patrol that has taken upon itself the task of protecting Finns from the 1,200 or so people seeking asylum there from Syria, Iraq and other places. In another ring is a troupe of clowns who skip through the streets carrying lollipops, feather dusters and toilet brushes, mocking and sometimes confronting anti-immigrant groups. The clowns, who call themselves the Loldiers of Odin, have emerged on the scene as champions of multiculturalism. 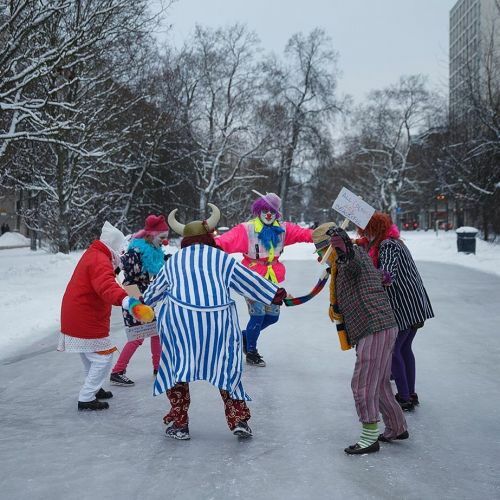 The photographer @ilvynjio captured the Loldiers of Odin clowning around in #Tampere last month." By nytimes on Instagram.